Price includes 2 dumbbells of the specified weight. 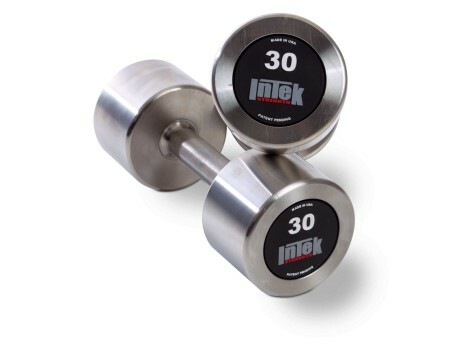 Unlike most of our other brands of dumbbells, Intek normally ships each size in pairs only. Contact us if you only need a single. The Delta Series is Intek's latest, best, and most unique design. At first glance, these look like chrome dumbbells. Not the same! Both the handles and heads are all stainless steel, not iron with chrome plating. Stainless steel is used in some very high quality olympic bars, but rarely in dumbbells. It's the most corrosion-resistant metal that is available, and there is no coating/plating to chip off. We're excited that Intek has come out with these. The face of each head is off-balanced just slightly, such that the LB marking self-levels with the weight oriented up, always. No more will you have to twist your head and stare at the row of dumbbells to pick the right size. And it just looks way more professional. Everything but the pound-marked face is one-piece solid stainless steel construction. That means no welds to fail, no bolts to loosen, no fittings to slip out. These dumbbells are available from 5 to 150 lb in 5lb increments, and also in 2.5lb increments in sizes from 7.5lb up to 52.5lb.